Today I’m in Annapolis enjoying some time with other sailors at a rendez-vous in the fantastic Chesapeake Bay area. I just came back from our daily event to find out that the wonderful blog Focusing on Life had selected one of my photos for its weekly focus. I’m surprised, grateful and very honoured. Thank you so much! I really admire this amazing collaboration of 10 women friends, who found each other through the Internet. I am moved by the way they share their lives and support each other to climb to new creative heights with their photography. I think you will find their site quite delightful. Each month they choose a theme and invite photo submissions. Their theme this month is barns. I can remember being drawn to photographing barns from a young age, often with my father and sister. I love the architecture, the texture, the colour and the settings of barns. 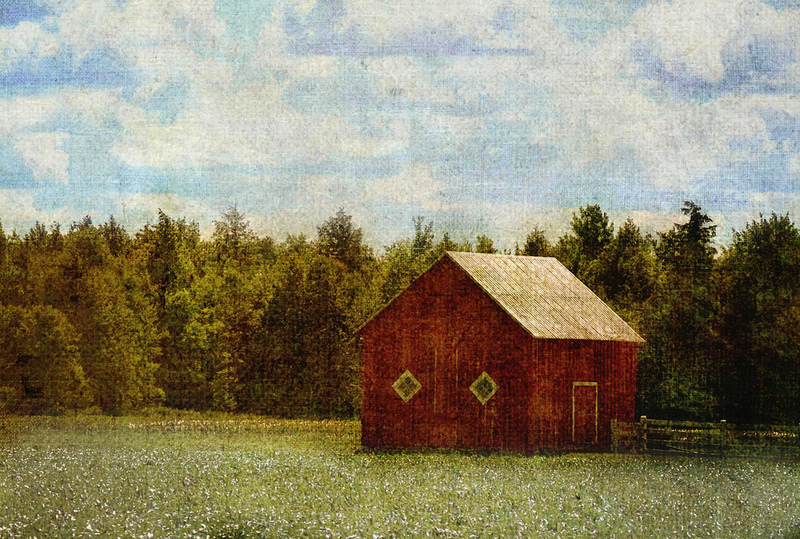 Now that I live in a more rural area, there is no shortage of picturesque barns to satisfy my creative urges. This photo was taken near my home outside of Ottawa, Ontario. I was captivated by the colour of the barn, the windows and the light. I applied a Flypaper Texture to give it the kind of magical feeling I imagined. If you like working with textures, you might want to give these a try. They’re amazing. Sparks of Grace postcard series before you go. Thanks, Deb. I like simple. Congratulations, Sherry! This is a wonderful photo and I’m so happy that you decided to share with us at FOL. I love your blog and will be back to visit. Thanks ML. I do love barns and there are so many around here I would love to photograph. Great of you to drop by! So very nice of you to say! I’m glad it fit in well. I’ve been away but I do plan to follow your blog closely and contribute when I can! Thanks for the kind words. It sure seems as though you are having a wonderful time. Nice to see! Sherry, I see that some of my “sisters” from Focusing on Life have already commented, but I wanted to thank you so much for taking the time out of your busy days to not only visit us at FOL, but to contribute such beautiful work for our INFOCUS feature. Your photo is stunning – just perfect for our theme, and very deserving of the INFOCUS selection. Thank you for your kind words on your own beautiful blog. We appreciate that very much! Loved this shot the second I saw it, Sherry! Those adorable little windows and the sky . . . amazing! The texture you used is just perfect. We hope to see more of your wonderful work at Focusing on Life in the future and thank you for all your nice comments about our blog. Thank you for such kind words about Focusing on Life! It has truly been a great experience for the 10 of us and we are pleased to hear that other people are enjoying it. Your barn photo is just beautiful and definitely worthy of the INFOCUS feature! Thanks so much for entering our monthly photo contest at Focusing on Life and what a lovely barn this is. Love your processing and thanks so much for giving our blog a nice mention.